The history of Christian iconography is rich. The use of symbols to represent theological ideas is an art form all its own, and a part of our tradition that extends to the earliest days of Christianity when symbols were often used to assist in “translating” bible stories and to teach theology before literacy was widespread. Our churches are laden with symbols and artwork that tell the history of our salvation; that underscore important themes of eternal life, abundance, God’s providence and our redemption; and that enhance our devotional experience in their beauty and craftsmanship. Symbols, pictures, and iconography tells the story of who we are and offer a visual means to make sense of our vibrant tradition. 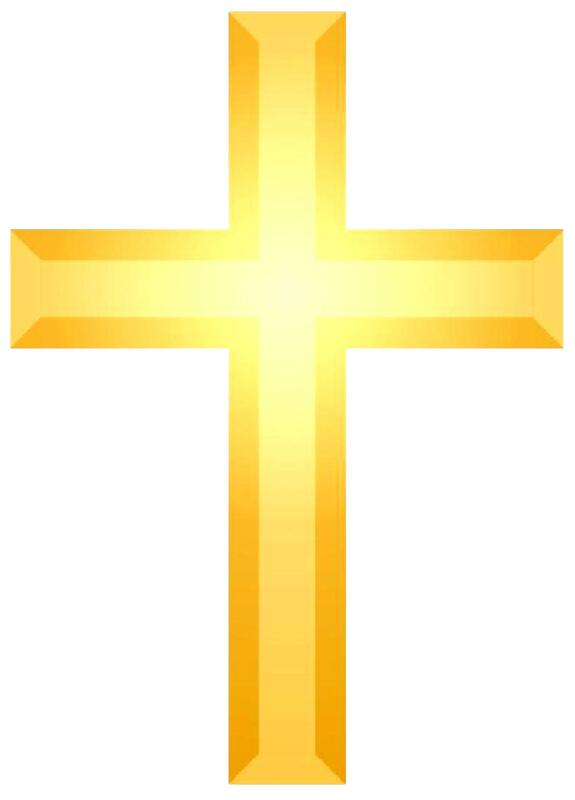 The most recognized symbol of the Christian tradition is, of course, the cross. In it we remember the death of Jesus by which we have received our eternal salvation. Episcopalians/Anglicans generally feature an “empty cross” in their churches (instead of a crucifix) which underscores our emphasis on the “outcome” of Christ’s death rather than his passion. Matthew is ascribed the Winged Man; Mark, a Winged Lion; Luke, an ox; and John, an Eagle. The origin of these animals as symbols is drawn from both Ezekiel (Ch. 1) and the Book of Revelation (Ch. 4). 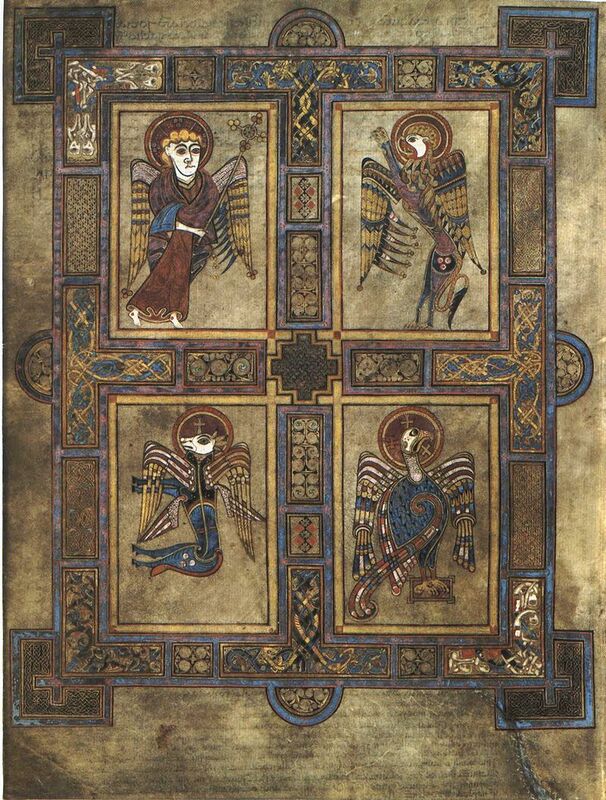 Here they are depicted in the Book of Kells, a great illuminated manuscript from the Celtic tradition around the year 800. As the pantheon of saints grew in the church, each one was given a symbol, for easy “decoding” in artistic renditions. 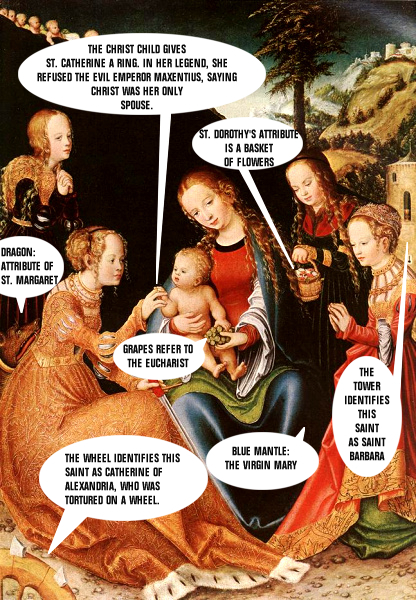 This comic illustrates the usefulness of symbols in Christian art. The Virgin Mary is often depicted in Christian art as wearing blue and bearing a lily, the flower that, in medieval times, was found to best symbolize the purity of Mary. By the 14th century, it was common to find the lily in Annunciation paintings and illuminations. In many scenes of the Annunciation painted during the Renaissance, the Archangel Gabriel holds a lily. The color that Mary wears has been linked to the color of an “empress” (www.quora.com) from the time of the Byzantine Empire in late Antiquity. It is also the color of lapis lazuli, a precious blue stone worth more than gold, and so it was an expression of devotion and glorification to portray Mary in blue. Jesus is often referred to as the Lamb of God. Coming from the prophesy in Isaiah where we are promised a Messiah who would be led, “like a lamb to the slaughter” (Is. 53:7) and later, in the Gospel of John where John the Baptist announces Jesus’ arrival as the “Lamb of God,” (1: 29) and finally in the Book of Revelation where the lamb appears and we read “worthy is the lamb that was slain…” (Rev 5:12), the lamb figure is a common figure for Christ. 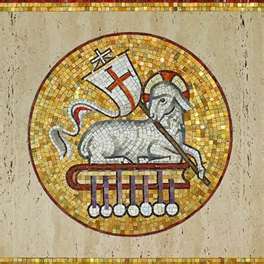 As a visual motif,since the Middle Ages the lamb has been most often represented with a halo and a foreleg “holding” a pennant with a red cross on a white ground, symbolizing the triumph of the resurrection. In our diocese, we have recently chosen to “re-fresh” the shield and symbol of the Diocese of Central Pennsylvania. 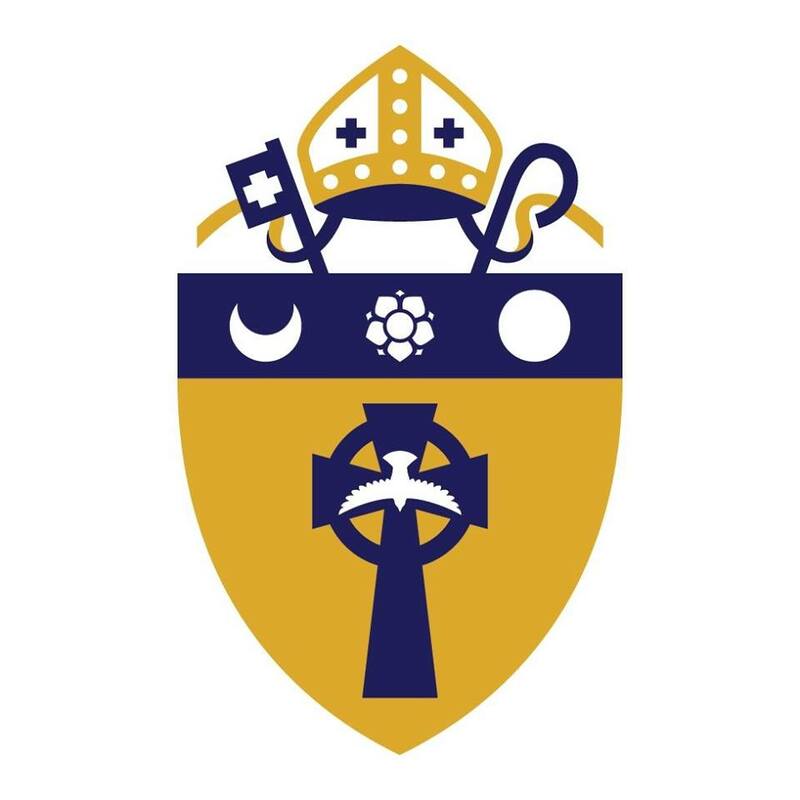 This refreshed symbol is part of a larger effort to bring all of our diocesan communications into sync by offering one “look” for the website, print correspondence and digital communication. So why this update now? I look forward to the new, uniform look that we can present as a diocese that is smart and fresh- and I look forward even more to continuing our work together as God’s faithful people, shifting, changing and being responsive to the Holy Spirit as we serve God’s mission. It may look like a slightly altered logo. We were blessed to have a Lenten Study on Christian Iconography at Holy Trinity Episcopal Church, Hollidaysburg, hosted by the Rev. Jeanne Jacobson. Nanette- what a gift! When I was at Yale I took a class in Iconography and Christian art. Glad you all got to do some good work in this area. I imagine you and John had plenty to contribute!